French scholar; settled at Perpignan, where he died in 1306. Abba Mari, who was a relative of Meshullam, lamented the latter's death in a letter of condolence which he sent to the community of Perpignan ("Minḥat Ḳena'ot," MS. No 132). Abba Mari also bewailed Meshullam's death in one of his liturgical pieces. 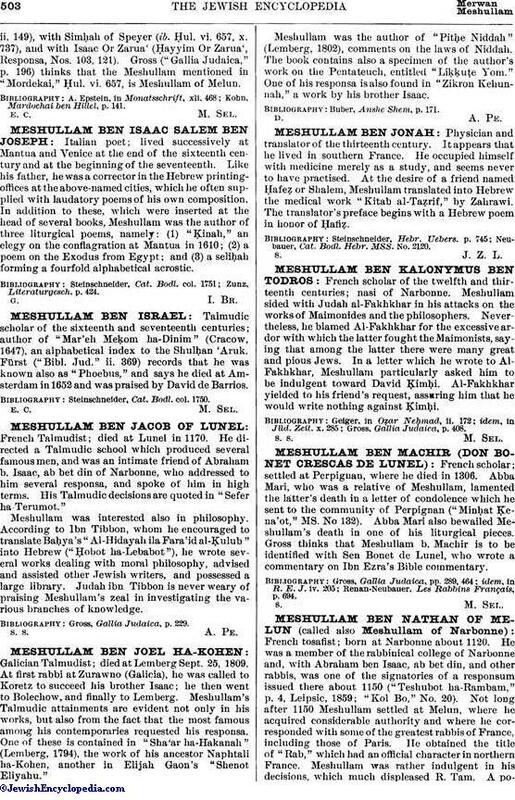 Gross thinks that Meshullam b. Machir is to be identified with Sen Bonet de Lunel, who wrote a commentary on Ibn Ezra's Bible commentary. Renan-Neubauer, Les Rabbins Français, p. 694.